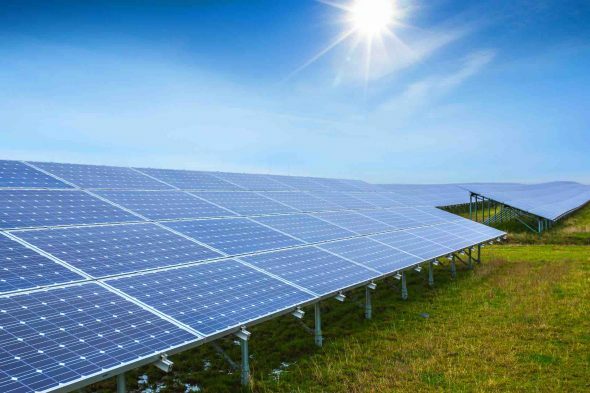 In the largest solar power purchasing deal ever by an industrial energy user in Australia BlueScope Steel will take the bulk of the electricity from the 133MW (AC) Finley Solar Farm to be built 100km west of Albury. The landmark deal with ESCO Pacific and Schneider Electric continues the rush of major corporate buyers towards solar technologies, with Finley expected to supply the equivalent of 20 per cent of BlueScope’s Australian electricity purchases, “significantly” reducing costs and providing price certainty. In a 7-year deal the electricity will be used to help power its Port Kembla Steelworks. Coal-ition politicians please take note. Work will start on the solar farm in late September, with electricity flowing from mid-2019. And please take note, Mr Turnbull, the company building the plant does not need an agreement covering the subsequent years. This could be because all but one of NSW’s coal plants are due to close over the next 20 years. 20-year deal to buy solar power to feed its six Australian factories, underpinning a commitment by the chocolate confectioner to source 100 per cent of its electricity from renewables by 2020. It also follows a commitment by UK billionaire Sanjeev Gupta to power his steelworks in Whyalla with solar and storage, a commitment that will result in more than 1GW of large-scale solar and storage. Another major energy user, Sun Metals, has also switched on a 124MW solar plant in north Queensland to supply one-third of the power needs of its zinc refiner and to underpin a major expansion of its operations. Numerous other major corporate buyers have also turned to wind and solar, with the likes of CUB aiming to go 100 per cent, and packaging giant Orora sourcing wind and solar for 80 per cent of its electricity needs, accentuating the vast chasm between economic reality and Canberra political rhetoric. Since his GFG Alliance bought the ailing Arrium steel producer in Whyalla last July, Gupta and his team have been detailing bigger and better and clearer plans to build up to 10GW of solar, as well as storage, to power his own and other energy intensive industrial majors, and generally revitalise Australia’s manufacturing sector. But still, the message is not getting through – at least, not to some. And the frustration is starting to show. “It’s still everybody’s perception that it is cheaper to make power from coal than it is from renewables, and it is no longer the case,” Gupta told Guardian Australia in an interview on Monday. “It was the case not long ago, but it’s no longer the case, and we will prove it,” he said. UK “green steel” billionaire Sanjeev Gupta has unveiled a stunning, landmark agreement to provide cheap solar power to five major South Australian companies, promising to slash their electricity costs by up to 50 per cent. The eight-year deal signed with a consortium brought together by the SA Chamber of Mines and Energy (SACOME) – and including some of the heavy hitters in the resources industry – will enable Gupta’s SIMEC ZEN Energy to fast track the construction of the 220MW Cultana solar farm near Whyalla. In the forests of central Sweden, construction is about to begin on a giant wind farm with a single purpose: to supply power to the aluminium smelters of Norsk Hydro, one of the world’s biggest producers, for the next 29 years. The wind farm, which cost €270m to build, highlights an important development in renewable energy — a growing number of investments from heavy industry. Recent deals from cement plants and aluminium smelters signal how a market is developing for renewable energy, particularly during a time of volatility for traditional energy prices, as some of the world’s most carbon-intensive industries try to go green. Karnataka, which lies along the southwest coast of India and has a population of more than 60 million, had a total of 12.3 gigawatts (GW) of renewable capacity installed as of March—after having added 5 GW in 2017/18 alone, the report finds. The gains helped Karnataka’s renewables sector overtake that of the neighboring state of Tamil Nadu, which had long been India’s top renewables market. Time for the Coalsheviks to realise they have lost and to join the 21st century. New high efficiency, low emissions (HELE) coal fired power stations are being constructed around the world and can reliably deliver electricity on demand virtually 24 hours a day at competitive costs. A 2017 independent study by Solstice Development Services and GHD engineers on generation costs concluded a large HELE plant had the capability to deliver the lowest cost 24 hour per day electricity, from $40/MWh or a mid-point price of $59/MWh. 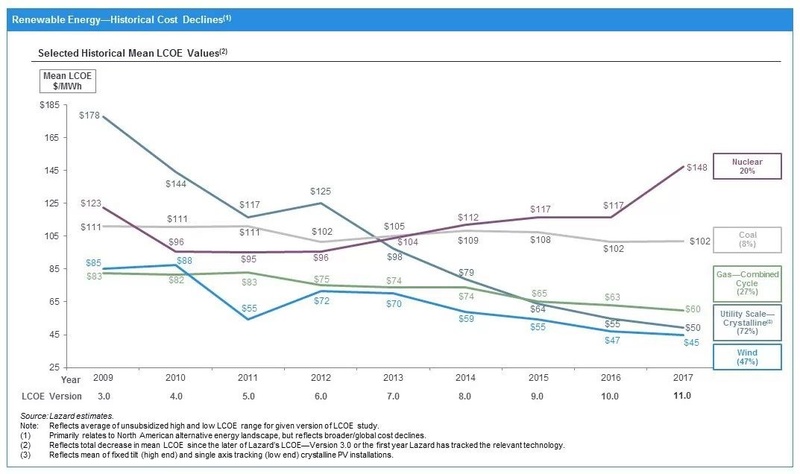 Yet Dr Finkel’s Independent Review, published 9 June 2017, shows in Appendix A – Levelised Cost of Electricity, that the average LCOE for Ultra-supercritical (or HELE) coal is $80 – 81/MWh. And the AEMO’s ISP-2018 indicates new coal is not competitive with renewables. I think it’s also doubtful that new coal-fired power stations could profitably achieve capacity factors at or near 95% with more renewables entering the energy supply mix. Bit brave of governments to try and stand between numerate capitalists and lower cost power? Nail on head, John D.
Now can we please see one of these numerates organise pumped hydro integrated with solar or wind farms? Or is molten storage a better bet? Not really, been happening for yonks. Id be surprised if they didn’t. Now can we please see one of these numerates organize pumped hydro integrated with solar or wind farms? Pumped hydro + solar is happening in a mine in nth Qld. It takes advantage of old pits. It is potentially good for longer term storage with the economics depending on old pits or good dam sites. There is no reason why salt water cannot be used. a question. Molten salt makes most sense in combination with solar towers. It doesn’t cost much and it doesn’t cost much to add back-up solar heating. The salt mix uses cheap readily available salts. Solar thermal with molten salt can be used to produce baseload or slow response peaking power as required. This should give you an idea of how brave (or courageous) governments would be. What about all the subsidies that renewables enjoy? Here’s an interesting take on the subject.